Life Is Sweet...: Happy New Years!!! Anyways, I wanted to share this gift card holder that I made for Teri for Christmas. 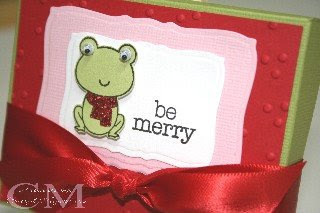 The 3 dotted red background was made using the new Sizzix embossing folder. I love how deep the embossing shows up on the cardstock. All stamps are Hero Arts. I've been busy working on some projects for another tv show taping for the Joy of Crafting. This will be the first "live"show taping and I'm getting a bit nervous since we will have an audience this time. Hope you're all having a great New Year's eve! See you in '09! Such a cute gift card holder! 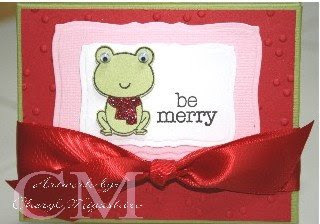 LOVE the frog!! I'll see you at the live taping--glad you're going to be on! cute frog! great job on the GCH for Teri...I know she must have loved it! hope you had a happy new year! Super cute Cheryl!!!! Hey, just wanted to let you know that I posted an award for you on my blog today, check it out!!! super cute card cheryl! i have that same frog, and find him adorable! good luck with your taping ... an audience would make me so nervous. lol! I just love this GCH! Thank you for making it for me! !